The linden flower tea benefits are largely due to the high concentration of phytonutrients, flavonoids, and other diaphoretic substances. This unique mix of organic compounds has resulted in one of the most trusted and reliable herbal tea varieties on the market. Now, let’s take a slightly closer look at the many health benefits of linden. Linden begins with blooming in May and blooms until the beginning of June, which is quite a time interval, and it is very good because it’s flower is fragrant, beautiful and honeyed. The flower is picked immediately after it is opened, must be collected and dried in cold place. This flower contains Vitamin C, tannins, essential oils, glycosides, sugar, wax, mannitol, etc. The linden leaf is a large reservoir of calcium. The traditional use of this herb is against colds and infections, but the most popular is its calming effect. Linden has the power to slightly reduce the blood pressure, relaxes the body and helps you to fall asleep easily. Linden is regularly present in the cosmetics; various oils are made from linden, shower gels, fresheners and much more. Also linden is used for easier excretion of fluids from the organism. Treats Respiratory Problems – Linden flower tea is recommended for treating colds, flue, bronchitis and other similar respiratory problems. Not only does it reduce fever by promoting sweating, but it also alleviates cough, reduces sore throat irritation and pain as well as nasal congestion due to it mucolytic action (it helps dissolve mucus). Prevents Cancer – With its impressive arsenal of antioxidants, linden is a definite contender for preventing and treating various forms of cancer. Those antioxidant compounds, like quercetin and coumarin, prevent free radicals from causing apoptosis or mutation in healthy cells, which often leads to cancer! Aids Digestion – Linden tea has been traditionally used for digestive related disorders, such as irritable bowel syndrome. Drinking one cup of this tea can soothe an aching stomach due to feelings of bloating, gas, diarrhea, and cramps. Treats Anxiety – The most well-known benefit of linden tea is easing nervous tension and promoting relaxation. Its ability to help calm and soothe the nerves makes it a fantastic tea for those who are suffering from anxiety. Drinking linden tea may help relieve headaches. The sedative qualities of this tea make it an excellent sleep aid as well. One hot cup of this tea before bed can relax your nervous system and help you get a good night’s rest. 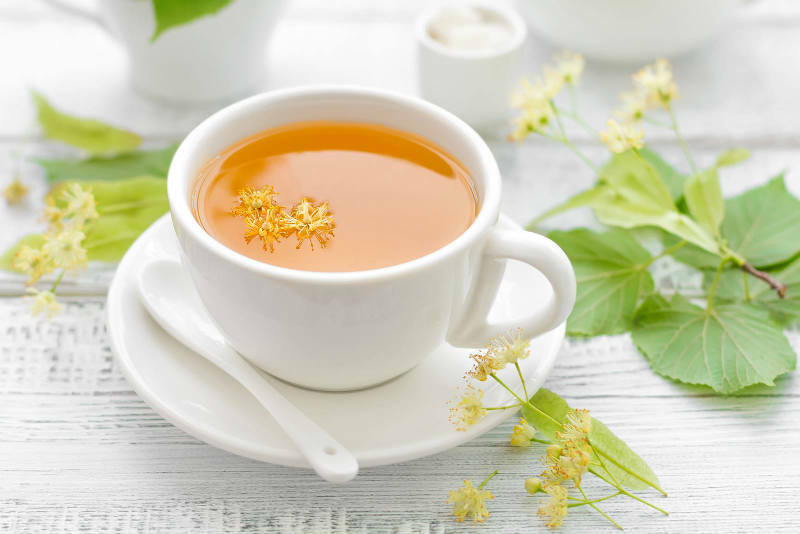 Linden Flower Tea Benefits for the Heart – Linden reduces blood pressure because the farnesol it contains acts like a natural calcium channel blocker (drugs that are in this category include amlodipine, nifedipine and diltiazem among others). Linden tea also is a mild diuretic and gently dilates blood vessels allowing blood to flow more freely. It is one of the most useful trees of this type. It can be found everywhere and it is available to anyone. Then why don’t we use linden regularly? The stress that we have accumulated from the working day will quickly be accumulated with a linden flower tea.